Today I have my dear friend Richelle Z. sharing about her recent trip to Lisbon, Portugal. Richelle has some great tips for visiting Lisbon and while the city was never really on my radar before, it is now. Richelle is from the midwest, but is now living (and working) in the UK. She has traveled extensively throughout Europe and Asia. Thanks so much, Richelle! Close your eyes for a moment and try to envision a city that is beautiful, culturally diverse, easy to navigate, ripe with delicious food, historically significant, and incredibly affordable. I’m guessing that in the pantheon of cities that one might picture, Lisbon, Portugal would not come to mind. While Lisbon might not have the major attractions of European mega-cities like London, Paris, and Rome, it absolutely deserves to be on your “must visit” list. 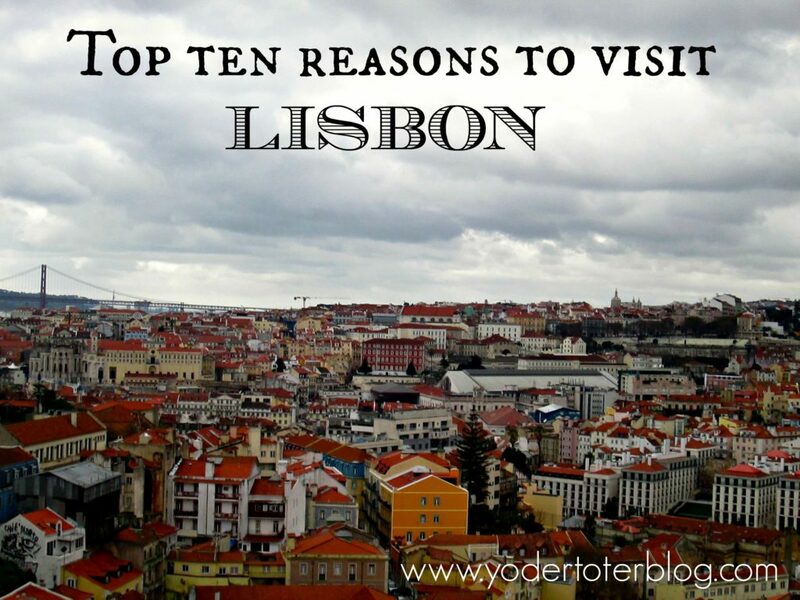 Having just returned from a glorious four-day trip to Lisbon, here are my top ten reasons as to why Lisbon should be at the very top of that list. It’s less touristy than other major European capitals, so it has a far more authentic and original feel to it. I don’t know about you, but I love traveling to a place where very few people look and sound exactly like me. In other words, I want to experience something new and exciting. In Lisbon, you will absolutely have that chance, as far fewer tourists visit the city. Not even factoring in the twelve-year low of the euro to the dollar, Lisbon is a tremendously affordable European capital. You can afford to travel very well in this city, staying in gorgeous hotels that you wouldn’t be able to afford in Paris and eating fancy meals that you wouldn’t come close to affording in London. Public transportation is also extremely cheap. Speaking of public transport, it is one of the easiest cities that I have ever navigated. Lisbon’s metro system runs frequently and continuously throughout the city, extending to the airport and nearby Belem very quickly. For those who have tried to make sense of the nightmare that is the Paris Metro or who have nearly cried every time they swiped their Oyster card on the oh-so-expensive London Underground, this should be a welcome treat. Food, food, and more food. (Who doesn’t love food?!) The food in Lisbon is absolutely amazing! I had the most delicious seafood stew that I have ever eaten in my life. Not only was this arroz de Marisco full of actual seafood (shrimp, scallops, crab, mussels, fish, and more), it was only twelve euros. One can also indulge in chocolates, flamingo cheese, sardines, port, and fruit juices at incredibly low prices. 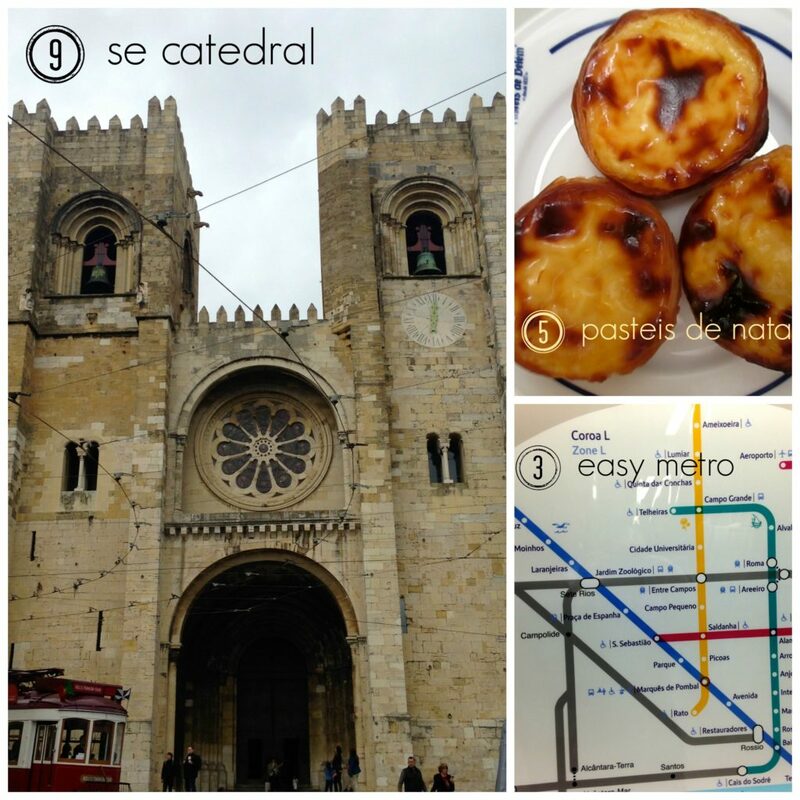 Lisbon is also known for the pasteis de nata, the most amazing custard tart that you will likely ever eat. It’s also entirely possible that one of the reasons I initially wanted to come to Lisbon was to eat this tart. And I was not disappointed. These custard tarts can be found all over the city (I ate my first one immediately upon arrival in the Lisbon Airport), but the best ones will be in Belem at the Antiga Confeitaria. Be prepared to queue here, though, as the word has gotten out that these little custards are pure bites of heaven (and the true original). If you want to experience dynamic nightlife, Lisbon has you covered. The city really comes alive after ten p.m. or so, much like Barcelona and Rome. This is not just nightlife in the sense of clubbing or all-night raving, mind you, but relaxed, enjoyable cocktails, tapas, fado music (which we sadly didn’t have a chance to experience live), and late night meals. For those who are really keen to experience Lisbon after dark, head to Bairro Alto. A quotidian Saturday night will feel like New Year’s Eve in Times Square. Portugal was once a world leader in terms of exploration and navigation, and this is something that the people of Lisbon still recognize today. The city commemorates the role that Portugal played in the Age of Discovery with the Monument to the Discoveries in Belem. This is a statue depicting great explorers and leaders in the country’s history with the beautiful backdrop of Belem to highlight it. Nearby in Belem, you’ll also find the Torre de Belem, which was built in the early 1500s as a defensive tower. I really enjoyed this part of the city (for many more reasons) and I would highly recommend visiting it. The cultural gems of Lisbon are truly world-class. The city has top art museums like the Museu Nacional de Arte Antiga, beautiful botanical gardens, the Mosteiro dos Jeronimos, and the Castelo de Sao Jorge to name just a small few. The wonderful thing about Lisbon, however, is that the city is relatively small and compact enough to afford visitors the opportunity to see all of these sights in the space of a long weekend. The Alfama. This part of the city, once Moorish, really encapsulates all that is unique about the city. I loved wandering through the winding, hilly, brightly tiled streets of this part of Lisbon because it was unlike any city I had ever seen. Strolling through the Alfama will also take you to two of my favorite sights in Lisbon, the Castelo de Sao Jorge and the Se Catedral. I’m sure you’re thinking that you can find castles and cathedrals in any other European city, and, while that’s true, there is something really special about the Se Catedral. The cathedral, built on the site of a mosque, dates back to the mid 1100s and has survived earthquakes in its time. It is not to be missed. Last, but certainly not least, the people of Lisbon are truly warm and friendly. I always felt safe and welcome wherever we went in the city. It’s impossible to characterize a city based upon people you randomly encounter, but I was left with a pretty great impression of the people of Lisbon. It’s impossible to capture all of the reasons why I feel Lisbon should be on your travel list, but I hope these ideas have left you excited and curious to visit this dynamic city. Let’s not tell too many people how wonderful this city is, though, so we can keep it to ourselves for a bit longer! The custard tarts looks amazing. If for nothing else, I’d love to travel to Lisbon just to try one!